Welcome to the 1st series on 'Clinical Pictures in Obstetrics and Neonatology' of the Perinatal Society of Malaysia. These pictures are meant only for educational purposes and is not to be reproduced in whatever form for commercial interest. It is hoped that readers will be enlightened and encouraged in their quest for better knowledge and understanding of some interesting conditions in the practice of perinatal medicine and nursing. A baby boy was delivered by SVD in a private clinic with a birth weight of 3.5 kg . There was no antepartum or intrapartum problems. On day 4 of life mum noted that the baby was vomiting after every feed. 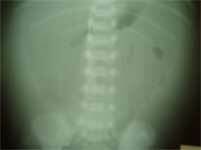 The vomiting became worse and associated subsequently with abdominal distension. Baby was then admitted to the hospital. He developed respiratory complications and was intubated and ventilated. Q 1. What investigations would you do to determine the diagnosis? Q 2. 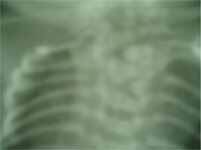 What does this X'Ray show? Q 3. List 3 causes of gut perforation? Click to enlarge The mother of this baby came to labour room in 2nd stage of labour. She did not receive any antenatal checkup. A baby girl with a birth weight of 1.5 kg was delivered vaginally. She had apgar scores of 4 at 1 min and 6 at 5min. The baby had respiratory distress in labour room and was immediately ventilated. Q 1. What is the obvious abnormality seen that will clinch the diagnosis? Q 2. What one investigation would you do to confirm the diagnosis? Q 3. What is the treatment? Q 4. Could this problem be prevented with good antenatal checks? This little boy came to the emergency ward on day 9 of life with a history of mild cough and lethargy . On examination he was afebrile with a respiratory rate of 65 per min. Examination of the heart, lungs and abdomen was otherwise normal. However he was noted to have a rash over the face and abdomen. He was delivered by SVD with a birth weight of 3kg. Mum had chicken-pox and he was admitted to the neonatal ward and observed for 1 week. Q 1. If mum had chicken-pox 3 days before delivery what should have been given for the baby? Q 2. How long should the baby have been observed before discharge? Q 3. What is the diagnosis and treatment of this baby now? Q 1. 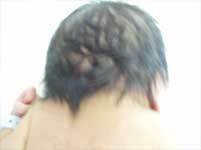 What is the lesion at the back of this baby's head? Q 3. What is the other obvious feature associated with this syndrome? The mother of this child did not realise that she was pregnant until the gestation was 3 months . She was a 32 year old lady who worked in a karaoke pub. The baby was delivered by SVD and had an apgar score of 5 at 1min and 6 at 5min. Q 2. What is the diagnosis ? This newborn baby was picked up at routine examination to have short neck. Q 1. What is the diagnosis ? Q 2. What is the abnormality? Q 3. What other abnormalities are often associated? This baby was delivered SVD with a good apgar score. Baby weighed 3kg and on routine examination was found to have an incomplete Moro's response. There was also poverty of movement of the right arm. Q 1. What is the abnormality seen ? Q 2. What is the diagnosis? Q 3. What are the bony changes you may expect to find on Xray of the right upper limb? Q 4. Could this be problem be prevented with good antenatal checks? Answer : Baby must be separated from the mother as long as she has lesions that are still wet. Q 2. .What is the diagnosis ?